NATALIE SUDMAN (Episode 3 of 3 with Natalie): “If you don’t know Natalie Sudman, you’re missing out on one the most enlightening near-death experiences of our time. This is my 3rd interview of a 3-part series with Natalie, but you don’t need to watch her previous interviews to understand or enjoy this one. Although at some point you will want to watch all 3 for the full, life-changing experience that they offer. near-death experience in this third and final interview of the series. 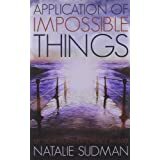 NATALIE’S SUDMAN’S BOOK – Application Of Impossible Things: A Near-Death Experience In Iraq CLICK HERE TO PURCHASE. This is an amazing true story of a female civilian employee of the Army Corps of Engineers in Basrah and Nasiriyah, Iraq. She was riding in a truck when a roadside bomb destroyed the vehicle. Her body was so severely damaged that there was no possible way she could live. She vividly recounts her Near-Death Experience when she went out of the body to the spirit world. There it was decided that her work on Earth was not done and with the help of spirit guides, they repaired the body so she could reenter it. She retained the conscious memory of what happened and during the time in the hospital, more details returned. This is the amazing story of a survival in wartime conditions. This has happened to many others in Iraq, but how many remember the spirit side of the experience? NATALIE SUDMAN’S BIOGRAPHY: Natalie worked as an archeologist in the Great Basin states for sixteen years before accepting a position managing construction contracts in Iraq. After being injured by a roadside bomb (improvised explosive device–IED), Natalie has since retired from government service. She is now enjoying art, writing, and continuing explorations into the non-physical. Raised in Minnesota, Natlie Sudman has lived most of her adult life in eastern Oregon, Montana and South Dakota. She recently moved to southern Arizona. Her artwork is available through Davis & Cline Galleries in Ashland, Oregon. In case you missed it, this is Natalie Sudman’s first interview where Natalie tells the story of her encounter with a roadside bomb (IED) and what happened when she left her body and had a near-death experience. In the blink of an eye, Natalie found herself in another dimension, what she calls the BLINK ENVIRONMENT. Surrounded by thousands of other-wordly beings, she instantly began downloading minutely detailed information to them about events, thoughts, concepts, judgments, projections and connections regarding her physical life so far. Thus begins this fascinating story of spiritual insight and experience that will have you mesmerized by this Defense Of Freedom Medal recipient. This is a video you don’t want to miss.” ~ Bob Olson, Afterlife TV. In case you missed it, this is Natalie Sudman’s second interview where Natalie reveals what happened to her in the second stage of her near-death experience, which she calls the REST ENVIRONMENT. She talks about the relationship between spirit and soul, her experience having a Life Review, the matrix that connects all living things, coincidences as serendipity, choices we make and those we don’t make, the power of our beliefs over our intentions, and a profound final message about the gift of being human. If you were fascinated by this Defense Of Freedom Medal recipient in her first interview in Season One, you’ll want to watch or listen to this new video conversation that covers new, consciousness-expanding insights.” ~ Bob Olson, Afterlife TV . Another fascinating interview. In her previous was really upset about Natalie laughing on other side re: injury. Appreciated further explanation. However, still struggling with the humour in 3 yr. old being sexually abused or currently, best friend found out last Friday that she is terminal at 61. Always looking for answers. Love your website. Swartz’s 2nd book and The Afterlife of Billy Fingers. I appreciate your honesty. It takes time to fully wrap one’s mind around some of this stuff. You’re obviously on your way. I thank you for writing again. As I said just recently, you have some wonderful guests on your shows, many pertaining to NDE’s ! In my opinion, this one with Natalie Sudman just took NDE’s to another level ! Once again thank you Bob. I understand why you like Natalie’s interviews so much. She’s wonderful. Thanks again for writing. Thank you for writing and for reading my book. I love that you passed it along; that’s a great compliment. This particular NDE that you watched is quite fascinating, and Natalie is one of my favorite guests for many reasons that are probably obvious — she’s smart, articulate, and I love to laugh and she brings that out in me. Thank you for posting all three of these interviews so I could listen to them in order. I am a student of the teachings of Eckankar which has helped me experience the different dimensions of my being and has connected me with what Natalie calls the Sound of creation and the Sound underlying all sound. However there is something in the way she expresses the importance of focus and attention that has helped me make a new connection between my day-today life and the one I experience in dreams and soul travels. It was your book that eventually brought me here to watch these interviews. I’m very happy to hear that. There’s a lot of wisdom in those three interviews with Natalie. Glad you found us. Loved the interviews. So much wisdom. Keep up the great work Bob. Sure is a source of inspiration to seek the truth.